I grew so accustomed to guide arrows and objective overlays telling me where to go and what to do that it's a wonder I dressed myself each morning without a tutorial and a pat on the back. Success came painlessly and reward regularly, to the point that I must have mentally glazed over during the last week of my month-long marathon, my hands making the perfunctory click or flick of the control pad, my aplomb fading into apathy. Because now, after my annual Thanksgiving buffer, I can't say I remember how I did any of it. I remember scraps of stories. Sad, how someone who's saved the world can't recall how he did it. I can't say when I became so passive with videogames,or forgetful. As a kid, I bit down on my lip and fought to finish a game. Now games fight to hold my attention. Along the way, something must have changed. Was it the games or, as my parents warned me, part of growing up? "In major titles the emphasis has certainly been shifted away from making the player feel any sense of frustration," says Charles Pratt, a freelance game designer and researcher at New York University's Game Center. "Open world games such as Red Dead Redemption and Assassin's Creed: Brotherhood have traded the tightly structured levels where the player has to fight from the beginning to the end for missions that mostly involve traveling from one spot on the map to another, with maybe some light combat thrown in." Pratt cites Super Meat Boy, the 2D platformer by Edmund McMillen, as a recent game that swims against the current. Super Meat Boy's steep difficulty, one hit deaths and sadistic level design take a hatchet to its players' humility and flout the trend of frustration-free gaming. Old school in look and design, playing SMB requires lots of trial and even more error. Done correctly, a stage can be completed in seconds,but learning the method to do so may take hours. One misstep in Super Meat Boy spells death, then it's back to the beginning of the stage. The game can be (and usually is) frustrating, but that's not a mark against it. 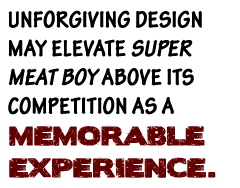 In fact, unforgiving design may elevate Super Meat Boy above its competition as a memorable experience.